It's been a crazy couple weeks here. We had our first snow, it was pretty, then I wrecked my car. Not so pretty then. No damage to me... Yeay! The car is still waiting for the body shop and the insurance company to determine it's future. So, I switched over to my winter driver (which I should have been driving anyway), the brakes went out on that after work one night, and I got to carry groceries home. Again, no damage to me, and none to my jeep, but really? My nerves are getting pretty rattled, and I can't get anything done when I can't get anywhere! One of my days stuck home, I was going to make banana muffins with my VERY ready banana's. Enough of making the banana's wait another day already. I head for my killer muffin recipe and get ready to rock out some muffins. Nope, they call for a cup of oil, and I could at most get a third cup out of the bottle. Nothing is easy this week! I remembered a recipe I had bookmarked a long time ago, and pull that up. I didn't remember them being such a healthy muffin, but what the heck, at least I had all the ingredients for this recipe. O.M.G. They were one of the best muffins I have ever made! I don't think they surpassed my "unhealthy" banana muffins, but they really were super good. The recipe makes a dozen, and for the two of us, that lasts a couple days, but even that very last muffin was still moist and tasty. Give 'em a shot, they can turn a bad week all around! Preheat oven to 375° Combine 1 1/2 cups all-purpose flour and whole wheat flour, brown sugar, baking powder, cinnamon, and salt in a large bowl; make a well in center of mixture. Combine banana, milk, oil, vanilla and egg in a bowl; stir well. Add to flour mixture. Stir just until moistened; fold in walnuts (optional). Place 12 muffin cup liners in muffin cups. Spoon batter into 12 muffin cups. To prepare streusel, combine oats, 5 T. flour, 2T sugar, butter and 1/4 t. cinnamon. Blend with a pastry blender or 2 knives until mixture resembles coarse meal. Sprinkle streusel over muffin batter. Bake at 375° for 22 minutes or until a wooden pick inserted in center comes out clean. 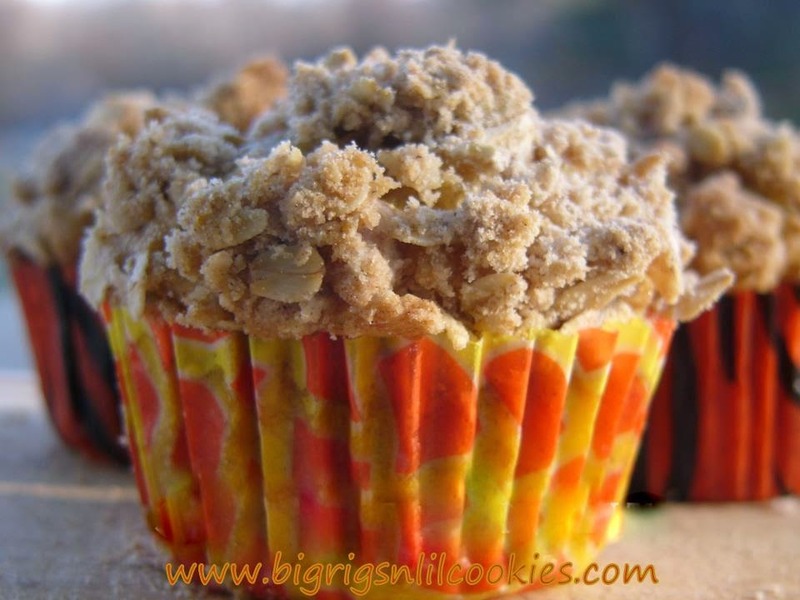 These do sound good and I really like the streusel topping! I can taste the texture of these muffins by reading the recipe. Please share them on my foodie friday party today they look so delicious. Wow! I am not a huge fan of raw bananas, but I love anything that resembles banana bread! These look amazing! Thanks for sharing over at Foodie Friends Friday! These sound so good! I love banannas, and have them on hand quite often. Following you from Weekend Potluck blog hop. Have a wonderful Thanksgiving, and I hope your car problems get better. Looks awesome. Love these with special breakfasts. Thank you. Oh my goodness, these are made for me, since they only use ingredients I absolutely love! YUM, these look fabulous!!! I love all things banana...and streusel! HA!